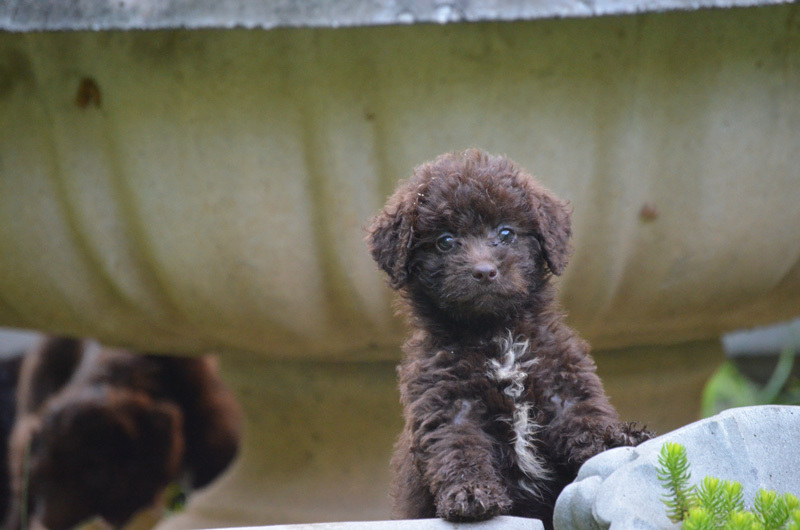 Is your family looking for an F1b Chocolate Labradoodle or Mini Labradoodle Puppy? If you’re looking for a mini Labradoodle ONLY, see our sister site miniLabradoodlePuppies.com. ChocolateLabradoodlePuppies.com serves Charlotte, NC, Charleston, SC, Greenville, Rock Hill, Asheville, Columbia, Raleigh-Durham, Atlanta, Jacksonville, Birmingham, Baltimore, Chicago, Indianapolis, Memphis, and Knoxville. Email nathan@crockettdoodles.com if you have any questions. If you're interested in a chocolate labradoodle, apply here. 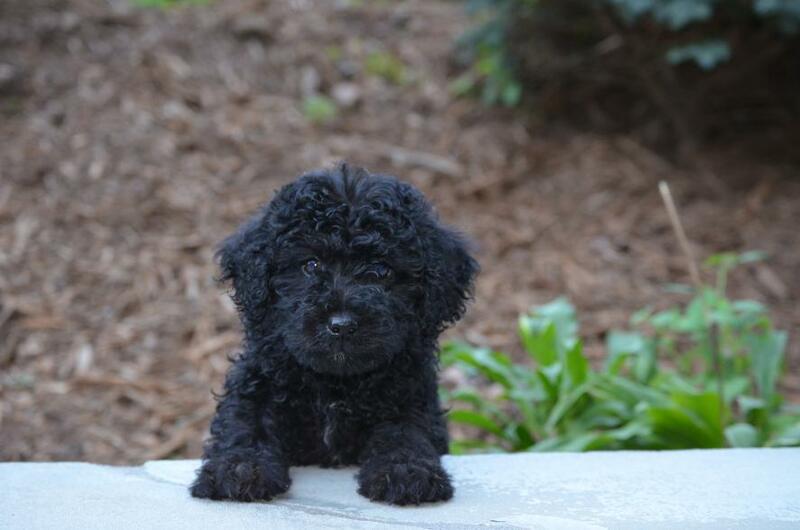 Chocolate Labradoodles and mini Labradoodles are our specialty, but we occasionally have black Labradoodles, white Labradoodles, or apricot Labradoodles and mini Labradoodles available. We have recently added a beautiful red Labradoodle to our program. To be considered for the next litter of mini Labradoodles, medium Labradoodles, or standard Labradoodles, email Nathan@crockettdoodles.com. We feed and recommend TLC puppy and dog food. We’ve found it to be the best food on the market for quality, price, and convenience (deliver fresh food to your door for free). Click below to find out more. ChocolateLabradoodlePuppies.com is located in Greenville, SC, near the North Carolina border. Most of our chocolate Labradoodle and mini Labradoodle puppy families come from Charlotte, Asheville, Charleston, Raleigh-Durham, and Hilton Head. We also have Labradoodle and mini Labradoodle families drive from Spartanburg, Columbia, Clemson, Atlanta, Raleigh-Durham, Chapel Hill, Jacksonville, Baltimore, Memphis, Knoxville, Chicago, Indianapolis and nearby states (Alabama, Florida, Virginia, Tennessee, Maryland, and Kentucky all seem to love Labradoodles). Keep reading this page to find out more about our philosophy and how we specialize in chocolate Labradoodles and mini Labradoodles. If you’re interested in getting on our Labradoodle waiting list for our next litter of mini Labradoodles, medium Labradoodles, or standard Labradoodles, please apply here. If you have any questions about our process, feel free to email us at nathan@crockettdoodles.com. At ChocolateLabradoodlePuppies.com our name says it all. We specialize in home-raised, F1b Chocolate Labradoodles and Chocolate Mini Labradoodles of quality disposition, with quality coats and genetic traits. If you’ve tried for any length of time to get a F1b Labradoodle or mini Labradoodle, you realize that chocolate is often the most difficult color to get. For many people, chocolate is their favorite Labradoodle color. 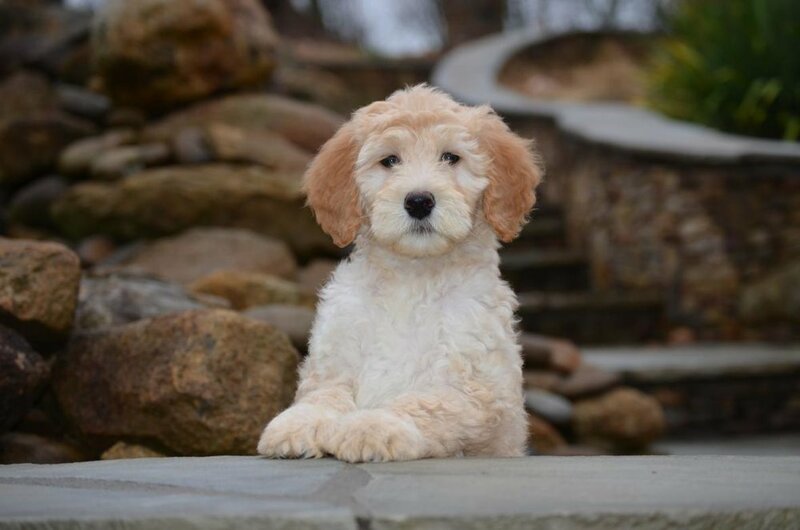 A person who wants a blonde, cream, or white doodle (or miniature doodle), may opt for a Goldendoodle (see bestGoldendoodles.com) rather than a Labradoodle. Chocolate Labradoodles seem warm and inviting. Labradoodles are perhaps the world’s most popular service dogs. Historically Labs, Poodles, and Golden Retrievers have been the world’s most popular service dogs. It’s no wonder that the original purpose for breeding Labradoodles was to be guide dogs and service dogs. Labradoodles and mini Labradoodles have the brains, the temperaments, and the loyalty to become excellent service dogs. With some service dog environments (schools, hospitals, etc.) now requesting hypoallergenic service dogs, Labradoodles have become the natural choice. 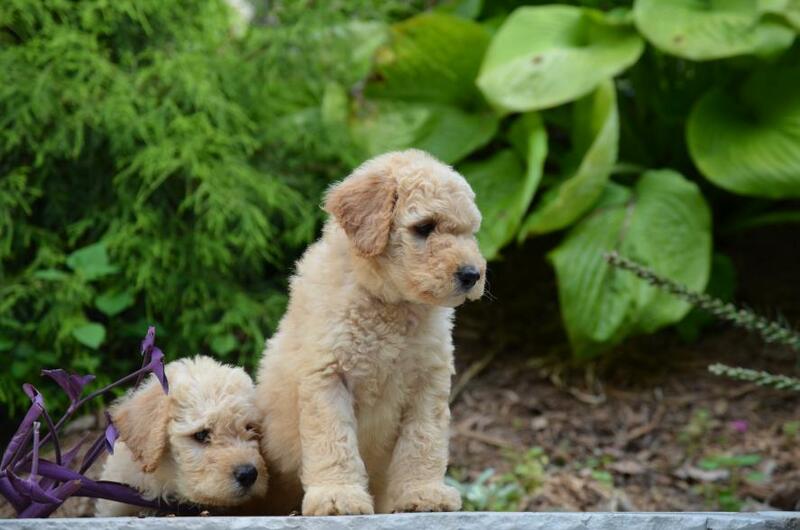 We are thrilled when we place our Labradoodle puppies as service dogs. I’m Dr. Nathan Crockett and my wife is Abigail Crockett. We are not full-time dog breeders. I am a theology professor at Bob Jones University (a non-denominational private, liberal arts Christian university in Greenville, SC). 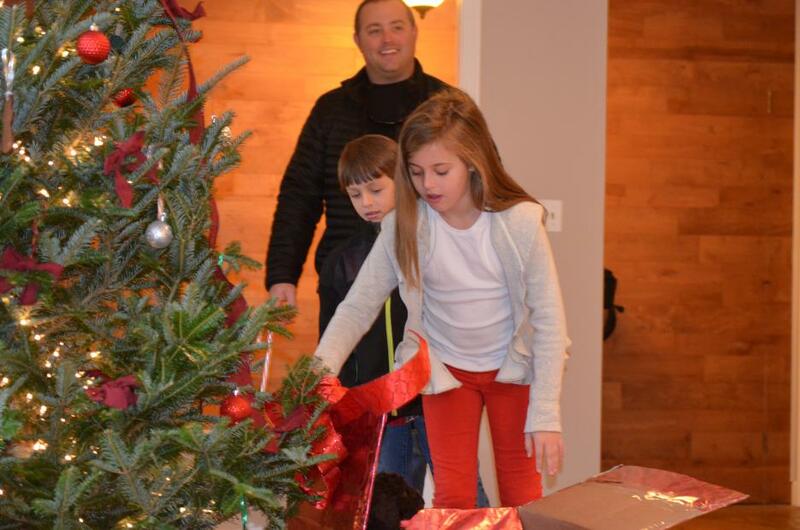 My wife, Abigail is primarily a stay-at-home mom for our 5 young children, but she is also an events coordinator. 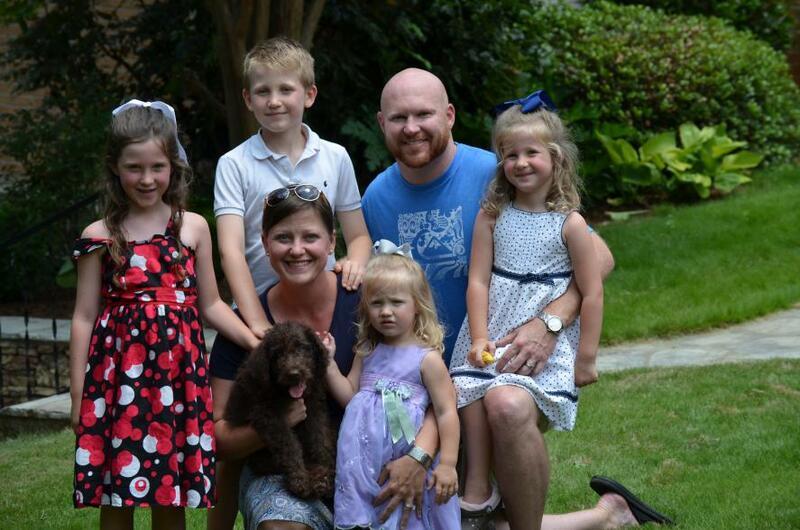 We enjoy matching Labradoodle puppies and miniature Labradoodle puppies to great families. Labradoodles are our hobby and passion, and we occasionally have puppies available. We are the exact opposite of a puppy mill. We have one female Chocolate Labradoodle and one purebred registered male standard Poodle, who are family pets. The mini chocolate Labradoodles and medium Labradoodles we’ve placed in guardian homes of close friends of ours are also the family pets of those homes. Our Labradoodle (Cutie) and Poodle (Charlie) are high quality dogs. Our mom was pick-of-the-litter of 13 first generation Labradoodle pups from a strong pedigree (F1 Labradoodles), and our dad is a purebred registered Poodle that was pick-of-the-litter from 11 puppies, with excellent parents (health, conformation, and temperament). Both our chocolate Labradoodle and our Poodle are beautiful dogs with excellent temperaments. They are our family pets. Because we begin with a Labradoodle and a Poodle, rather than a Lab and a Poodle, our puppies are much more likely to have the non-shedding Poodle coat. In the dog world, they’re called F1b Labradoodles (as opposed to F1 Labradoodles, which are 50% Poodle & 50% Lab). A F1b Labradoodle has been back-crossed to a poodle in an effort to insure a non-shedding coat. Even though most f1b Labradoodles shed very little or not all, it is impossible to guarantee that any dog (even doodles or purebred poodles) will not shed at all. It’s appropriate to call F1b Labradoodles hypoallergenic since they are “less likely” to cause allergies than most breeds. Hypo- means less (hypothermia is having a lower than normal body temperature). No dog can be said to be completely non-allergenic. Studies have shown that doodles are less likely to cause allergies, particularly f1b doodles. If you desire a Labradoodle that is non-shedding and hypoallergenic, you definitely should find a F1b Labradoodle puppy (75% Poodle; 25% Lab), as many first generation F1 Labradoodles (50% Poodle & 50% Lab) shed. F1b stands for “first generation (f1) back-crossed (b)”. Because the Labradoodle is bred back to a Poodle, a F1b Labradoodle is actually 75% Poodle and 25% Labrador. The ideal is to keep as much of the Lab head shape and super-friendly personality as possible while getting the non-shedding Poodle coat as well as the dignified, less vocal characteristics of the Poodle. Our Labradoodle methodology is quite simple. First, we get quality dogs. This is why we wanted to have pick of the litter for our Labradoodle and our Poodle and why we only obtained puppies from reputable breeders that we knew we could trust. Second, we try to treat our dogs (Labradoodle and Poodle) well. We feed our Labradoodle and Poodle high quality food with plenty of protein, and give them wonderful socialization and opportunities for exercise. We have 12 acres along the Enoree River with trails, additional property next to a Greenville state park, and property on Lake Hartwell giving us the opportunity to take the dogs kayaking. We recognize the importance of socializing young Labradoodle puppies so they will not be fearful as they mature. Our Labradoodle puppies have lots of opportunities to play with our children, and water games are definitely on top of the list. Labradoodles love the water (and so do my kids, as you can see below). 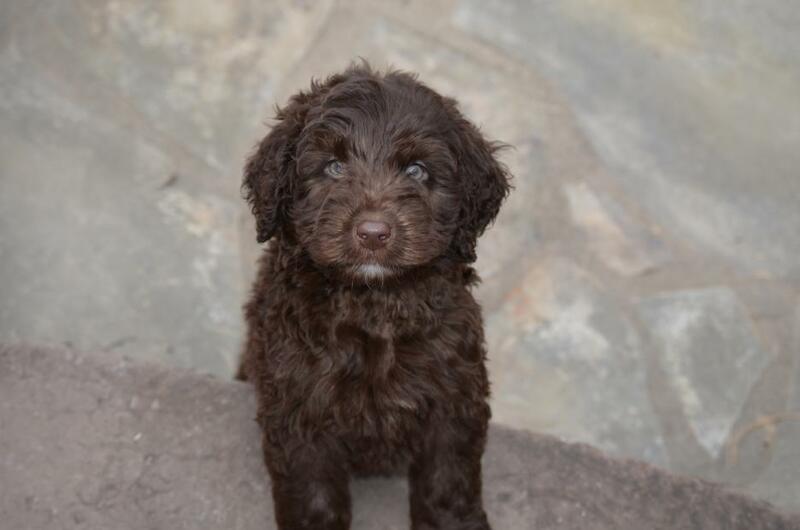 Third, we try to find appropriate families for our Chocolate Labradoodle puppies. We do not put prospective Labradoodle puppy buyers through background checks or have them fill out mounds of paperwork to adopt a Labradoodle or mini Labradoodle, but we don’t sell to just anyone. To learn more about our process, check out this resource that gives a step-by-step guide between the application to receiving your puppy! Because our livelihood is not based on our Labradoodle/mini Labradoodle puppies, we seek to be objective and realistic with potential adopters of our Doodle puppies. A Chocolate Labradoodle or mini Labradoodle is not for everyone, and a puppy is not for everyone. If your family is not prepared for a Labradoodle puppy (financially, time investment, etc. ), you’d be far better off waiting. We don’t pressure anyone to get a Labradoodle puppy or mini Labradoodle puppy as we have far more demand than we have available puppies. When can you get your puppy? Because we have only one Labradoodle mother (and a couple guardian homes), puppies are available only occasionally. Contact us (nathan@crockettdoodles.com) for information about getting on a waiting list for a Labradoodle puppy or mini Labradoodle puppy if you’re interested in a puppy from the next available litter. We have a flexible waiting list and offer your deposit back if we do not have the ideal Labradoodle puppy for you within a certain window of time. If we determine your family is a good match for a Labradoodle puppy, you can take your Labradoodle puppy (or mini Labradoodle puppy) home when he/she is 8 weeks old, and the vet gives the green light. Sometimes with mini Labradoodles we prefer to wait until they are a little older than 8 weeks because accidents tend to happen more easily with really small puppies. We will take several pictures of you with your Labradoodle puppy. We will send you the pictures for free (place them on a USB thumb drive for you), and you will have full copyright privileges to all of the pictures to use at your discretion. You have the option of whether or not the photos appear here on the ChocolateLabradoodlePuppies.com website. We will NEVER ship Labradoodle puppies, as we think shipping puppies is a horrible start to their new home. Although we never ship puppies, we will sometimes personally deliver puppies for a reasonable fee. We are located in Greenville, SC, near the North Carolina line, and most of our puppy families come from Charlotte, Asheville, Raleigh-Durham, Charleston, Jacksonville, Rock Hill, Baltimore, and Hilton Head, although we also have families drive from Columbia, Clemson, Atlanta, Memphis, Knoxville, Indianapolis, Chicago and other states (Alabama, Florida, Virginia, Tennessee, Maryland, etc.). 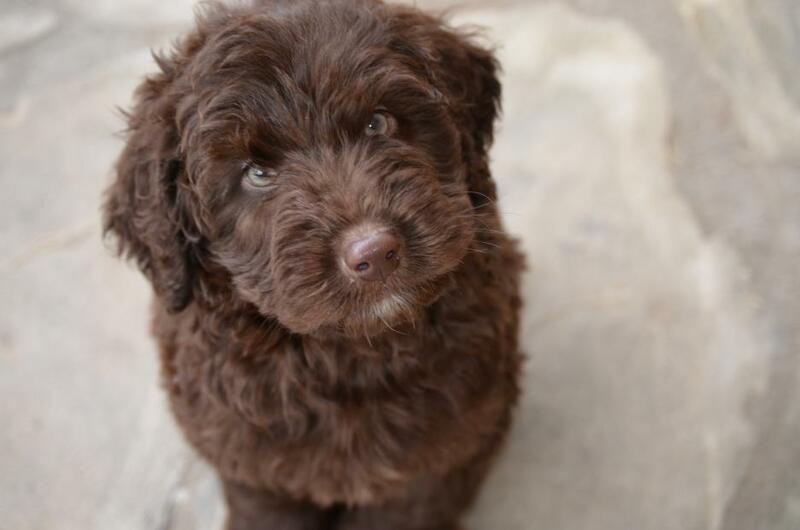 Why should you consider getting a Chocolate Labradoodle from us? 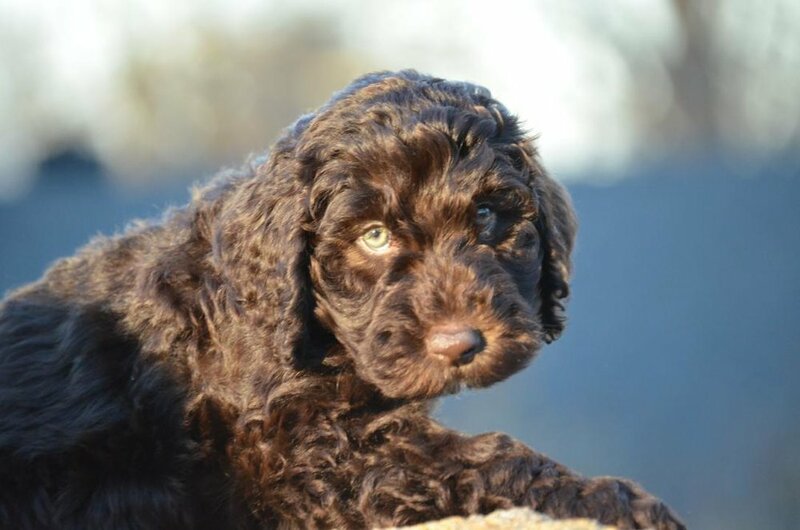 If a Labradoodle or mini Labradoodle puppy is right for your family, and if you are within driving distance of Greenville, SC, you may want to consider getting a chocolate Labradoodle or mini Labradoodle from us. If you read our Labradoodle puppy methodology and like what you read, you should consider adopting one of our puppies. We have a three-year health guarantee on each of our puppies if the forever home continues to feed TLC (one year health guarantee on all others). We encourage you to do your research, and talk to us if you’re interested (email nathan@crockettdoodles.com). If you’re concerned about shedding, you definitely should get a F1b Labradoodle or F1b mini Labradoodle, and if you like the color chocolate, than we might be a good match for you as Chocolate Labradoodles are our specialty. 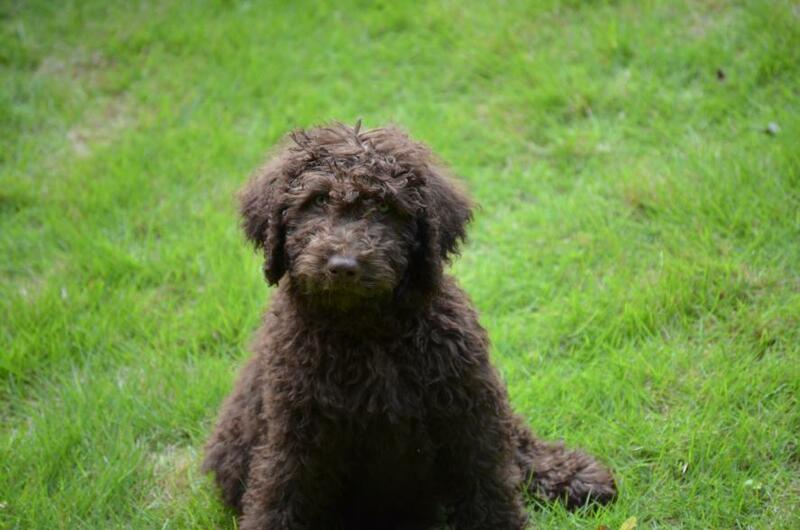 How can you get a Chocolate Labradoodle or Labradoodle mini from us? 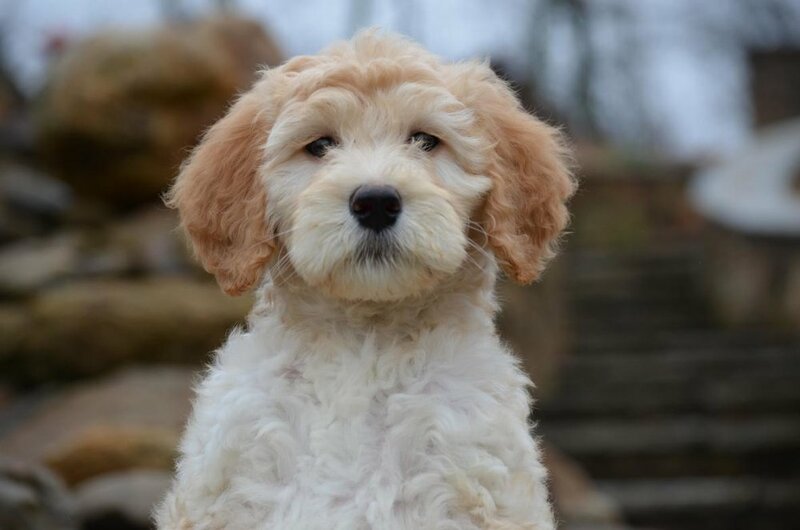 If you think your family would be a good match for one of our Labradoodle (or mini Labradoodle) puppies, then start the conversation by emailing us at nathan@crockettdoodles.com. A Photo Session (of your Labradoodle puppy with you, or just the puppy if you prefer). You will have full access to all pictures and hold the copyright to make as many pictures as you desire. This is not a “bait and switch” photo session that gives you a few pictures, but requires you to pay for additional ones. You keep all the pictures. We give your Labradoodle (or mini Labradoodle) puppy a quality collar. We give your Labradoodle (or mini Labradoodle) puppy a quality leash. We give you a bag of high quality dog food. We believe that you should give your new Labradoodle puppy (or mini Labradoodle puppy) the best food. Instructional materials about crate training and house training. Our goal is to do everything we can to assist in the house training and crate training process. A Labradoodle or mini Labradoodle puppy (or any puppy) cannot be completely reliable in the house until the puppy is about 6 months old. The simple point is that (no matter what some breeders tell you) you will be partially involved in the house training process (unless you buy an older Labradoodle or mini Labradoodle), but we want to help you with that process. A one-year health guarantee; extended to three years for all who continue to feed TLC. Our Labradoodles are not a business; they’re our hobby. If we wanted a Labradoodle business, we’d have more than one Labradoodle mother at our home. We are concerned with finding really good homes for our Labradoodle and mini Labradoodle puppies. If you are happy and have a happy doodle puppy, we know that we’ll continue to have a waiting list much longer than we’ll be able to meet. If you’re interested in one of our Labradoodle puppies, please email nathan@crockettdoodles.com to find out how to get on our waiting list. To see a list of available colors, check out this page. At ChocolateLabradoodlePuppies.com we intentionally specialize in excellent quality F1b chocolate-colored Labradoodles. Ultimately we cannot completely control the color of puppies. Even though chocolate is the most desirable color, we sometimes have puppies of other colors (even occasional merles). These puppies, will of course, also make excellent pets. These non-chocolate Labradoodle puppies are also available to great families, but we know that Chocolate Labradoodles are the most desirable. It is not that the apricot Labradoodles, blue (silver) Labradoodles, white Labradoodles, or black Labradoodles will be any less quality of a pet, it’s simply a matter of supply and demand. A F1 Labradoodle (50% Lab / 50% Poodle) will virtually never end up with the same high quality coat that a F1b Labradoodle has. The Labrador Retriever has a short coat that sheds. When the Lab’s coat is mixed with a beautiful non-shedding Poodle coat, the resulting Labradoodle puppies will often have a scruffy-looking coat, that may well shed (a little or even a lot). By breeding the F1 50-50 Labradoodle back to an unrelated Poodle, the chances of getting the highly desirable non-shedding Poodle coat increase exponentially. Some F1B Labradoodles are bred back another time to a Poodle in an effort to guarantee a Poodle coat. If high quality dogs are chosen to breed that have the head shape of a Labrador Retriever it is possible to get a puppy that is very similar in many ways to a Labrador, but has the beautiful non-shedding Poodle coat. Both Labrador Retrievers and Poodles are highly intelligent dogs, helping Labradoodles excel in smarts, train-ability, and a general desire to always please their owner. If you desire a family-friendly, kid loving, medium energy dog that is comfortable inside or outside, that loves the water and the land, you should definitely consider a Labradoodle or mini Labradoodle. If you desire for your Labradoodle to be non-shedding (hypoallergenic), you will definitely want to get a F1b Labradoodle (75% Poodle), and if you desire for your Labradoodle to be a chocolate color, then you have certainly come to the right website. 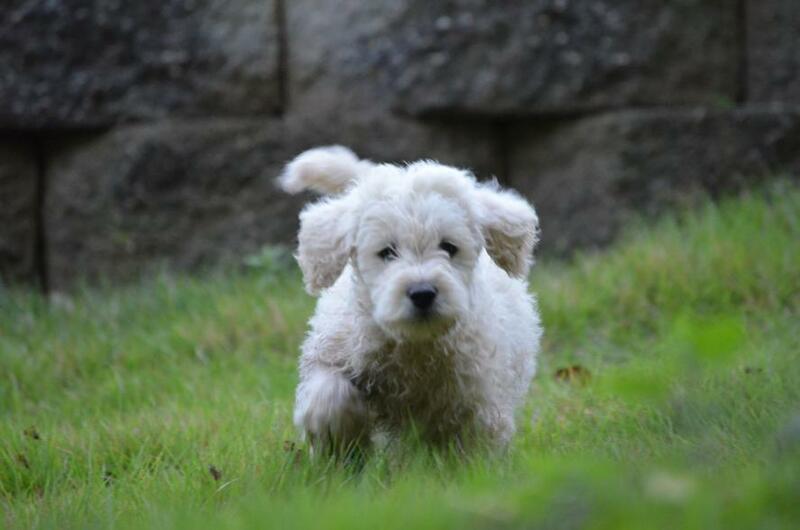 For more info about Labradoodle puppies or mini Labradoodle puppies, please email nathan@crockettdoodles.com. Check out our sister site miniLabradoodlePuppies.com for additional great pictures! ChocolateLabradoodlePuppies.com is located in Greenville, SC and desires to provide high quality, non-to-low shedding F1b Chocolate-colored Labradoodles to well-matched families in North Carolina, South Carolina, and the Southeast. 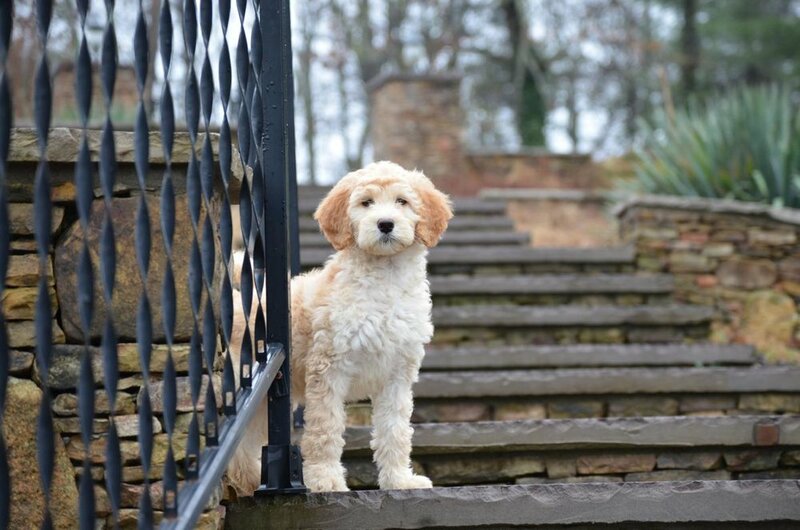 Great Labradoodle puppies and mini Labradoodle puppies for well-matched families in South Carolina, North Carolina, and Georgia. We specialize in Chocolate Labradoodles and mini Labradoodles, but often we have other colors as well. Although a few of our puppy families come from the area of Taylors, SC (Greenville County), most families travel a short distance from Charlotte, NC or Asheville, NC. We also have many puppy buyers from Charleston, Hilton Head, and Myrtle Beach. Occasionally someone travels from Atlanta, Columbia, Raleigh-Durham or Knoxville, but our proximity to North Carolina and the popularity of Labradoodles in North Carolina make Charlotte and Asheville our most serviced locations. We also have some who are interested from distant states, but we primarily serve the Southeast U.S.